Taipei, Taiwan and London, UK — 5th June 2014 — Schenker Technologies UK Ltd, subsidiary of Schenker Technologies GmbH, today announced two additions to XMG’s [C]ore Series of laptops, powered by GIGABYTE, as part of a unique partnership between the two firms. The ultra-thin 14” C404 and 15” C504 laptops are only 20.8mm thick and are manufactured mainly from aluminum, weighing in at 1.67kgs and 2.16kgs respectively. Featuring Intel® Core™ i7 4710HQ 3.5GHz quad-core processors and NVIDIA GeForce GTX 4GB 860M and the C504 upgradable to 6GB 870M graphics, both laptops are more than capable of playing all existing game titles on “ultra-settings” in full 1080p high-definition. Their 1920x1080 pixel matte AHVA screens offer superb colour reproduction and great contrast levels with a versatile 170 degree tilt. “We’re very excited about Schenker’s unique partnership with GIGABYTE Technology” explained Neil Richards, Managing Director, Schenker Technologies UK Ltd, “The laptop’s build quality, performance and design are second to none. Add XMG’s full 2 year, European collect and return parts and labour warranty, support and customisation, it’s an unbeatable proposition”. To combat the inherent issues of cooling in such a powerful and slim design, GIGABYTE’s Supra-Cool twin cooling technology independently cools the GPU and CPU separately and features software control to manage fan speeds under 3 different profiles. Each laptop can be loaded with up to 16GB DDR3 memory, the C404 will hold up to 2TBs in the formof a 2.5” drive and mSATA SSD and the C504, 4TB with space for 2 mSATA SSDs and 2 2.5” drives using an optional optical drive caddy. No gaming laptop would be without a gaming grade keyboard with highlighted WASD keys, white backlight and windows key lock. They also feature Dolby® Digital Plus™ Home Theater System Surround technology with 2 speakers and 1 subwoofer built-in for superb gaming audio on the move and through audio set-ups such as speakers and headsets. Other features include Gigabit networking with gaming LAN optimisation, HD Webcam, memory card, USB 3.0 and around 4 hour battery life. 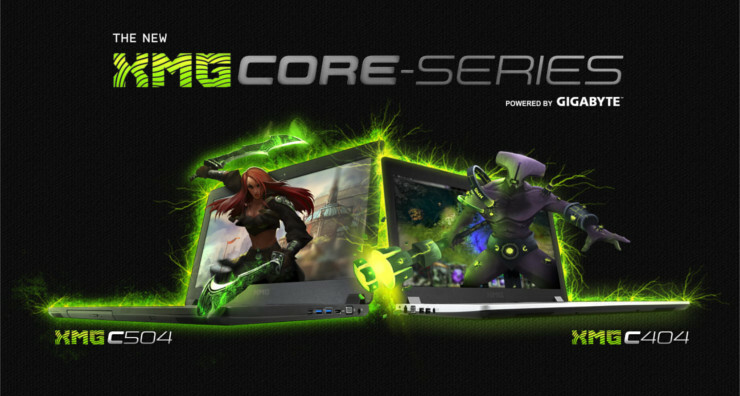 The XMG C404 and XMG C504 gaming laptops are available immediately at http://xmg.gg/core for purchase. Here customers have the ability to configure the laptops as they wish and order directly from the manufacturer. The CORE series products will begin delivering from the end of June 2014 with a starting price of £1,029 for both models. For more information on these and other enthusiast laptops visit http://xmg.gg/core.